Campaigners in Moray have teamed up to curb the amount of wind farm developments in the region. More than half of the major projects across the country currently with planning applications submitted to the Scottish Government are in the north and north-east. Now Mark Holdsworth, who runs a travel firm from his home in Dallas near Forres, has formed the Save Wild Moray action group with others to warn of the effects of over development from the renewable technology. More than 300 people have signed up to the organisation’s vision on its website to try and preserve the natural habitats. 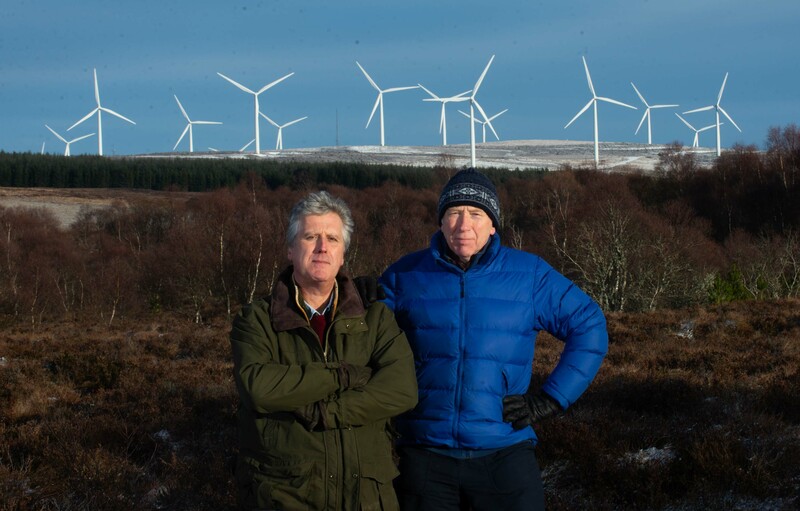 Mark Houldsworth (left) and George Herraghty are members of Save Wild Moray, a group set up to stop the wind turbines. Mr Holdsworth said: “There’s a lot that is coming our way. Up until now people have tended to fight developments that might be relevant to them – there’s so much now that we think it’s time for a group to look at the effect more broadly across Moray. “People have got to recognise the impact of these. One of the reasons tourists come to Moray is for the scenery and natural wilderness – that could be lost. The group is currently focusing its attention on the Clash Gour wind farm proposals, which could lead to 47 turbines up to 575ft tall being built about seven miles south of Forres. Developer Force 9 Energy has said the project could generate enough electricity to power up to 190,000 homes – while stressing the “unique” landscape of the area can accommodation a large wind farm with “careful design”. Final plans have also been submitted for the Pauls Hill II wind farm near Knockando, which would include seven turbines up to 500ft tall. The Scottish Government has stressed that renewable energy projects help create jobs, boost the economy and contribute to climate change targets. A spokesman said: “All wind farm planning applications must meet strict planning criteria.